C Glen Begley, author of The Amgen Study, is out of work again. After the company terminates the 19 employees it plans to, TetraLogic will be left with 10 employees, the Journal said. Among those terminated are G. Glenn Begley, the company’s chief scientific officer, and Lesley Russell, the company’s chief operating officer. Their termination will occur on April 19, the Journal reported. When Begley and Ellis wrote their paper on the difficulties of using bad science as a foundation for ones research they were acknowledging that there was a problem. Not everything we read in the journals is true. Some say most of it is not true. If you work in the biopharma industry you know that job of yours is contingent upon the success of the molecule on which you are working. If it does not perform according to the narrative of the company, you might be tossed out the door along with the project. Even if your job is to simply clone, grow, purify, define biochemically the molecule, you will be packing up your belongings from your cubicle if the molecule does not succeed in the clinical trials. TetraLogic had a plan. Birinapant was to be a treatment for high-risk patients with myelodysplastic syndromes. However, phase II trial results showed birinapant did not demonstrate any clinical benefit over placebo. The study has been terminated, and C Glen Begleys job has been terminated. So has 18 other individuals including the COO/CMO! Was that a part of their plan? Were the leaders upfront about the connection between everyones job and the outcome of the phase II trials of birinapant? Of course the CSO and CO/MO are a part of the leadership. They make the decisions and serve as spokesmen/women for the narratives of the company. Scientifically they had to have reason to believe that birinipant would succeed but I doubt they were betting their jobs on it. Birinapant is designed to mimic the activity of an endogenous protein, the Second Mitochondrial Activator of Caspases, or SMAC, which is involved in the regulation of the apoptotic process within cells. Avoidance of apoptosis is a critical step in cancer tumor development and certain infectious diseases. Birinapant reactivates one of the common apoptotic pathways, thus restoring the natural balance in our bodies. This is a completely novel approach to treating these diseases and may provide new treatment options for patients suffering from cancer or serious infectious disease. The company is reviewing its strategic alternatives in light of the birinapant clinical trial results announced on January 6, 2016. Myelodysplastic syndromes are a group of cancers in which immature blood cells in the bone marrow do not mature or become healthy blood cells. In patients diagnosed with myelodysplastic syndrome, the “blood stem cells (immature cells) do not become mature red blood cells, white blood cells, or platelets in the bone marrow. These immature blood cells, called blasts, do not work the way they should and either die in the bone marrow or soon after they go into the blood. This leaves less room for healthy white blood cells, red blood cells, and platelets to form in the bone marrow. When there are fewer healthy blood cells, infection, anemia, or easy bleeding may occur,” according to a report on cancer.gov. So birinapant was suppose to fine tune apoptosis of blasts which would make proper room for healthy white/red blood cells and platelets to form in the bone marrow. That was the narrative. Once the fine tuning was accomplished by birinapant the disease state would no longer bedevil the patient. It worked as well as, but no better than a placebo. The cynefin method of thinking would have helped the people who lost their jobs. All biopharma research projects have a narrative that states molecule X will cure or treat disease Y. Biotechnology works. 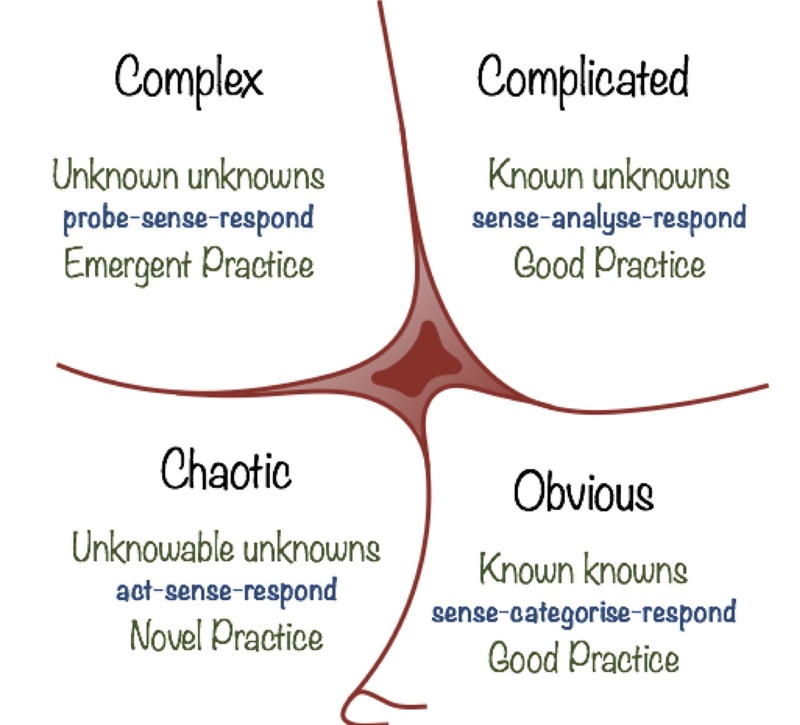 It operates in the known knowns area after the known unknowns are dealt with. Does birinapant properly mimic SMAC. That was a science/technology project that succeeded and that is the job of the scientific staff at TetraLogic. Then came the unknown unknown. Will birinapant go into the body, find its way to where SMAC was lacking and properly restore the function of the endogenous protein? When the narrative went from known unknown (SMAC is lacking and birinapant will fix the problem) to unknown unknown (will birinapant solve the problem?) and then to known unknown (birinipant will not fix the problem of SMAC deficiency) the project was deemed a failure and jobs were shed. That is how it works. Even an honest man such as C Glen Begley is not immune to this dilemma. Everyone working in science must admit that they are not going to get it right every time. The most perilous place to be is on the scientific frontline when the results come in.